Big Priest.. what can i say..Blizz philosophy style of deck. Strong.. makes the opponent feel helpless at turn 4.. and if you do win against it, with a not hardcounter Bigpriest deck.. it always felt like.. Wow i was lucky! Best feeling i had against a bpriest was. When i beat it while he had 4 spellstones (2×from vision)Cubelock i was and with Sylvana i stole his played lichking and rag.. so no rezzie rezz those 2.. And in the end he still almost got me..Thnx bliz! The moment you put down leeroy.. you cant be taken seriously any more..Leeroy is legend man.. its nostalgia to the max.. Leeeroooooyyy jennnnkinsss.. You sir should brought shame on yourself. Are there lots of new players going to wild suddenly? 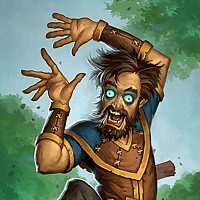 Should they nerf wild cards or ban card combinations? Banning cards is worse then nerfing it... That will destroy decks and cards.. A card nerfed usually make 1 deck weaker.. a card banned. Destroy multiple decks and classes..
Adios Jesse Hill. I hope you got a good lay off plan. And will find a fun new job again! You will be missed!